This image shows the Cyclone Class coastal patrol boat USS Firebolt shooting off a $100,000 Griffin surface-to-surface missile during a training exercise in the Arabian Gulf. Different variants of the Griffin have been put to use aboard everything from ships to unmanned aircraft to Ospreys to AC-130 Gunships in recent years, and many more platforms are like to come. The so called Mark 60 version of the Griffin was designed for littoral combat operations. The close in defense system consists of two four cell launch canisters, with eight missiles total. The package also included a infrared targeting system with a laser designator and a command and battle management system. When fitted in the Mark 60 canisters, the Griffin is given the designation BGM-176B. The whole idea of outfitting the Navy’s hard-working Cyclone Class (and possibly other) patrol boats with the Griffin is to give them an extra layer of defenses against swarming boats, a tactic Iran would surely employ during combat with its neighbors and the U.S. should hostilities ever break out. It is also a very effective and quickly employed weapon against potential ship-borne suicide bombers that may attempt to make a run at a patrol vessel ship or a ship it is protecting. The Griffin Missile also extends the range and expands the engagement zone for the Cyclone Class. In the past, these ships had to rely on their twin 25mm bushmaster cannons to engage targets that were not within small-arms fire, but still they are limited to a range of about a mile and a half. Now, with Griffin Missiles, the Cyclones can pummel targets at close to three miles away and at any angle from the ship. They can also do so more rapidly than using just the 25mm chain guns alone. The Griffin was passed over for the AGM-114 Hellfire when it comes to equipping America’s troubled Littoral Combat Ships with an anti-swarm missile system. This decision was partially because the millimeter-wave seeker version of the Hellfire, the same that can be used by the Longbow Apache attack helicopter, could use the LCS’s radar system to attack multiple boats in a single salvo. In other words, it would not have to be relegated to “painting” each target with a laser designator in order to attack. This is especially useful under poor visibility conditions or when being raided by a large swarm of boats. A similar system as the sea-borne Hellfire is being adapted from the UK’s capable Brimstone missile for at-sea applications, known as “Sea Spear.” Both missile systems are a far cry from innovative and much longer ranged XM501 Non-Line-Of-Sight missile system originally envisioned for the LCS but cancelled due to technical difficulties and budgetary constraints. 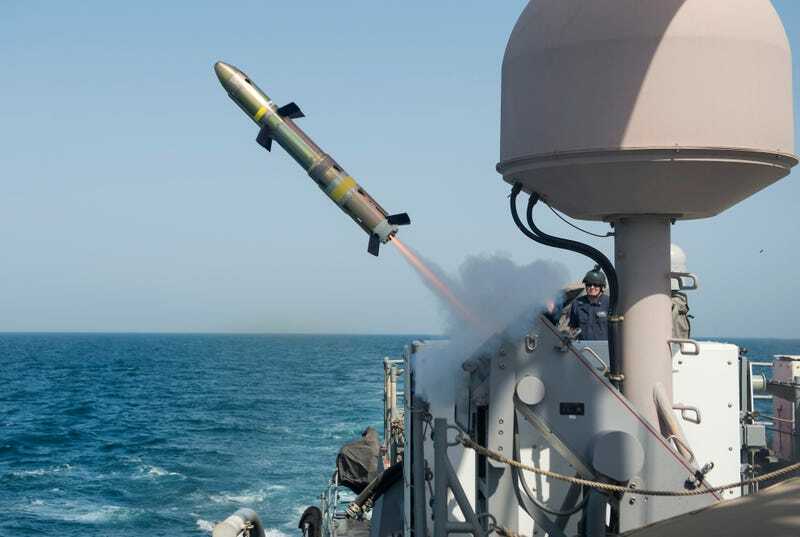 In response to the seemingly chaotic changes to the small-yield naval missile marketplace, Raytheon, who makes the Griffin, is going another route for their next generation Griffin Missile. Instead of tying the missile to one targeting source, whether that be radar or laser designation, they are diffusing the targeting options by including a data-link on the Griffin Missile. This can be adapted to take into account different sensors targeting information, such as feeding the missile live coordinates from a radar system in real-time, thus making it a “fire and forget” weapon. They are also adding an imaging infrared seeker to the missile that will allow users to no longer rely on hard-mounted targeting system at all. Instead the missile can be launched to an area and it will select targets on its own using image matching and onboard artificial intelligence, while at the same time sending live video of the target back to the user. The user can then give the missile the OK to engage the target it has spotted or tell it to go to the next target, or another area entirely to search for new targets. Not only will this approach be good for engaging targets in densely populated maritime environments, where visual identification of an enemy target is key, but it will also mean that installing Griffin onto a vessel (or even a basic ground vehicle) could be as simple as bolting on the launch canisters and putting up an antenna tied to a notebook computer. Once set up, the user could immediately begin receiving and ok’ing targeting imagery generated from launched Griffins. This means any boat or even a commercial truck could be turned into a precision guided boat or tank buster with almost no modification. The next-gen Griffin will also feature a new rocket motor that will allow it to travel out to over 9 miles from its launch point and will allow it to be able to loiter over the battlefield searching for targets to plink. The inclusion of a “plug and play” Griffin onto ships that feature minimal defenses today means that these vessels could be cheaply equipped with a devastating self defense weapon system that can create a sphere of defense from water-borne threats around the vessel at any given time. Such a capability could also round out the ‘low end’ of a potential U.S. Navy initiative to make many ships that are currently unarmed, such as many USNS supply ships, offensive shooters via installing bolt-on cruise missiles. It is clear that the defense industry is taking a clear sign from the consumer electronics marketplace and moving away from expensive, hard-installed proprietary hardware and going for more of a ‘plug and play’ and application approach to lower-end weapons systems. Instead of creating a combat vehicle to launch missiles, just create a missile that can be easily launched from any vehicle with a flatbed and operated by anyone with a laptop computer. With a range of almost 10 miles, the next-gen Griffin can give a Toyota truck or a HUMVEE as much killing power, and at greater range, than an M-1 Abrams main battle tank. Even more exciting, once the weapon is ‘networked’ it can use its data-link to proliferate targeting opportunities from a whole slew of assets, including both manned and unmanned aircraft. As such, an operator could just pick a target being tracked by an aircraft’s radar and send a Griffin its way, with the missile sending live video of the target back to the operator to ok a terminal attack. This concept could also work in reverse, where s centralized command center that has access to data from all the sensor platforms in the battle-space spot a target of opportunity and immediately send a command to fire a Griffin-like missile nearest to that target without the onsite operator interacting with the system at all. If left in ‘remote standby mode’ a HUMVEE with a package of Griffin or similar missiles attached would simply sound an alarm that a launch has been commanded remotely and the missile would be on its way to its target seconds later. So basically, by diffusing not just shooters but also the targeting sources, a commander even thousands of miles away, or a forward air controller in the field, can simply select the best weapon nearby and command its launch and guidance remotely. This creates a more survivable and unpredictable proposition for the enemy to compete with and makes serving up precision fire support truly a point and click affair. They may not be glamorous and they may not cause massive explosions, but combined together, these little missiles could change the way we fight future wars just as much as their bigger and much more expensive cousins.